Reese's Peanut Butter Cups is my all-time favorite candy. But now that we have two kids with a peanut allergy, and neither one of them can have milk, they don't get to share in my joy of a Reese's. 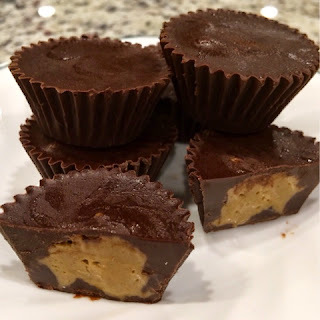 I have seen lots of pictures of homemade peanut butter cups and safe alternatives as well. I thought I would try my hand at it tonight. And I don't mean to brag, but these turned out a-ma-zing! It's worth your 15 minutes to make some for yourself. I used Sunbutter for the filling, but you could easily use whichever type of butter you like. Wowbutter or other nut butters would work just as well. Line a mini muffin pan with mini muffin liners (This will make about 12 mini cups). Over low heat melt chocolate chips and coconut oil. (The coconut oil helps keep the chocolate from being so messy. It can create a "shell" if you use enough.) Mix together sunbutter, powdered sugar, and melted butter. Fill muffin cups about half full with melted chocolate. Scoop a dab of the sunbutter mixture into the middle of each cup. Top with chocolate. Let set in refrigerator or freezer. Enjoy!